Attention, sports fans. Craving a curry with your cricket? A tikka with your tennis? The new Banana Leaf restaurant and sports bar, just off Tverskaya Ulitsa, offers both. 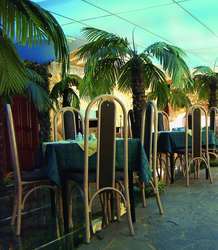 Its fresh, bright bar room has a huge video screen for showing sports, while the dining room is decorated in a tropical theme, complete with fake palm trees. The broadcast’s commentary is piped into the dining room via speakers, although there’s no screen to watch it on. The menu features Indian and Chinese dishes, so we started with servings of samosas (150 rubles) and spring rolls (185 rubles). The six small samosas were well prepared and tasty, while the chunky spring rolls were only satisfactory — confirming our theory that at Indian-Chinese combo eateries, it’s best to order the Indian. For our mains, we asked for something spicy, and on recommendation we ordered lamb rogan josh (495 rubles) and dahl makhani (190 rubles). The lamb was tender, but its curry sauce was bland, as was the creamy dahl. The garlic naan was, however, spot on, while the complimentary mango and macadamia nut ice cream was superb. To be fair, when the matre d’ asked how we enjoyed our meal and we replied it wasn’t spicy, he apologized profusely and got the chef to make us a spicier rogan josh to take home (the service here is admirable). Reheated the next day, the curry was indeed … spicy. 229-2114, sport bar 10am-10:30pm, restaurant noon-10:45pm.